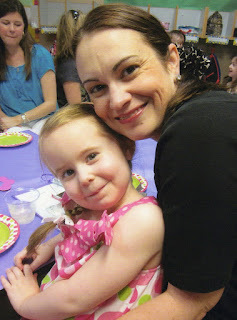 Julianne's class had a Mother's Day celebration today. The kids made us bath salts and filled out a questionnaire about their mommy. This is Julianne's. My kid knows me! I'm so glad she thinks that my favorite show is dancing with the stars and that she doesn't know my dirty secret that my favorite show is actually "The Real Housewives of Orange County"....or Jersey, or Beverly Hills, or Miami. I know, shameful! Julianne loves to take "selfies"
And we always have to do "silly faces"
I love this girl. I'm so blessed that I get to be her mommy. She is just awesome.